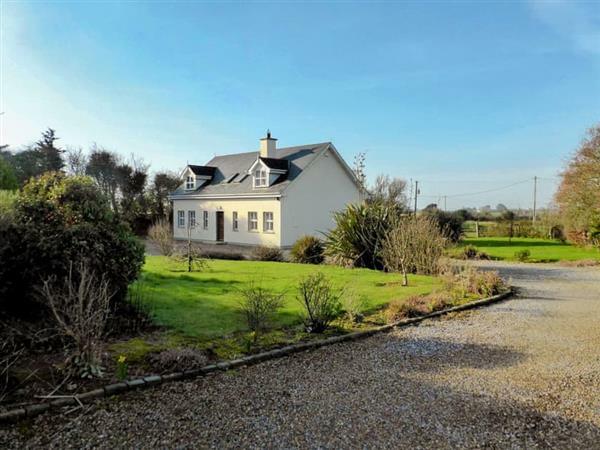 Belgrove Cross Cottage in Duncormick, County Wexford sleeps 8 people. Belgrove Cross Cottage in County Wexford is just a 10-minute stroll from the pretty riverside village of Duncormick, with its traditional Irish pub; this bright, spacious, detached property is ideal for families or groups. The large lawned garden is perfect for that morning cuppa or al fresco dining. The village lies on the River Muck and is one of the stops along the scenic Bannow Drive, which also incorporates Bannow, Wellingtonbridge and Cullenstown, 3 miles, which boasts an unspoilt beach overlooking the Ballyteigue Burrow Nature Reserve. The nature reserve originates from the last ice age and extends to 9km of sand dunes and wildlife. There are a multitude of beautiful walks to enjoy with the coastal route to the ’thatched village’ of Kilmore Quay, where boat trips can be taken to the remote Saltee Islands, offering chances to observe the local wildlife and breathe in the fresh sea air. It is also an anglers paradise with salt water fishing aplenty, and the owner is on hand should you need any advice. The ferry port of Rosslare and the medieval town of Wexford, with its famous Opera House, fine eateries and harbour, are both within a leisurely 30-minute drive, as are numerous interesting attractions including the JFK Arboretum, Hook Head lighthouse, Loftus Hall (reputedly Ireland’s most haunted house), Johnstown Agriculture Museum, Johnstown Castle and Wexford Wildfowl Reserve. There is a beach 3 miles from Belgrove Cross Cottage in County Wexford. With the shop, pub and restaurant all ½ mile from Belgrove Cross Cottage. Approximate distance to Cork airport is 180 km. Living room: With open fire, Freeview TV, CD player and wooden floor. Kitchen: With electric cooker, microwave, fridge/freezer, dishwasher and tiled floor. Bedroom 2: With double bed and tiled floor. Bedroom 3: With king-size bed and en-suite with shower cubicle and toilet. Bathroom: With bath, shower cubicle, toilet and Velux window. Oil central heating, electricity, bed linen, towels and Wi-Fi included. Initial fuel for open fire included. Travel cot, highchair and stairgate available on request. Welcome pack. Large lawned garden with gravelled terrace and garden furniture. Private parking for 3 cars. No smoking. For a better idea of where Belgrove Cross Cottage is, you can see Belgrove Cross Cottage on the map below. Do you want to holiday near Belgrove Cross Cottage (W32412), you can see other cottages within 25 miles of Belgrove Cross Cottage; have a look to find your perfect holiday location.